The Philippines is all geared up for its long trek back to Group 1 as it takes on a Pacific Oceania side that has never really gone past Group 2 in the Asia Oceania Zone Davis Cup tie beginning tomorrow at the University of St. Anthony covered courts here. Treat Conrad Huey, a noted doubles specialist, plays the lead role for Team Phl for the first time after long-time No. 1 and fellow Fil-Am Cecil Mamiit decided to yield the spot and instead serve as non-playing team captain of the squad that also includes Jeson Patrombon, Ruben Gonzales and Johnny Arcilla. The hosts, led by team manager Jean Henri Lhuillier of Cebuana Lhuillier, will be facing a team composed of Michael Leong, Cyril Jacobe, Daniel Llarenas, Aymeric Mara, who flew in here last Monday. “Our team is ready,” said Phl Davis Cup team administrator Randy Villanueva. The duel starts tomorrow with Huey tipped to kick off the hosts’ bid in one of the two singles matches. The other is a toss up between the fast-rising Patrombon and the power-hitting Gonzales, also a Fil-Am. Huey is also expected to play in Saturday’s doubles where he is fancied to flaunt his top form with any of his teammates. The reverse singles, if necessary, will be played Sunday. Villanueva also said the host city is as ready and excited as the players. “Iriga City is ready for its first international tennis event and it’s great because it’s Davis Cup, that’s why we’re thanking Mayor Madel Alfelor Gazmin for making this big event possible,” he said. The indoor stadium, according to Villanueva, boasts of a lighting that has 20,000 watts of metal halide which is considered as world-class. “The tennis court looks beautiful and is world-class, the support of University of St. Anthony is commendable and we are lucky to have its president, Atty. 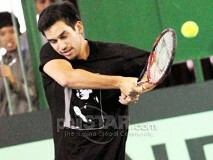 Nonoy Ortega, who is a tennis fan himself, for also lending a big hand,” said Villanueva.